Reptar | Do You Hear The Music? Fans of Reptar head to their Facebook page for a free download of “Orifice Origami” off their upcoming LP, Body Faucet, which was produced by Ben Allen and is due out May 1. If you haven’t yet listened to the Athens, Georgia group you are sorely missing out. Last summer/fall they toured with Foster The People and Cults gaining plenty of notoriety and just recently crushed SXSW. I highly suggest you get your hands on their EP from last year, Oblangle Fizz Y’all. Even more exciting news, they are hitting the road with GROUPLOVE in May! Not only did Austin City Limits practically sell out today (probably will by EOD) but the line-up was released and WOW, Zilker Park is going to be music mania September 16-18. I know the line-up every year is packed with big time talent but this year already screams epic time to be had. Amazing job by C3 Presents to put together what can easily be considered the best festival line-up of the year. Click HERE to purchase tickets. Full line-up below. 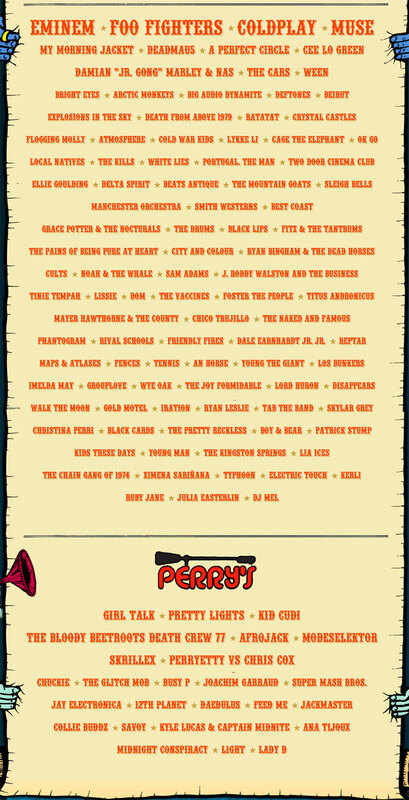 Lollapalooza released the 20th anniversary line-up today and while there are definitely a handful of artists making the summer festival rounds, I think they did a great job when you look at the line-up from top to bottom. Eminem, Foo Fighters, Coldplay and Muse as your headliners are definitely four big ones you can’t argue. Now personally as I contemplate making the trip, I’m excited about so many of these bands and quite frankly too many to list but (and trying to take out the artists I’m planning to see at Bonnaroo) Ween, Crystal Castles, Local Natives, The Kills, White Lies, Two Door Cinema Club, Delta Spirit, Sleigh Bells and Chicago’s own Smith Westerns. Plus Fitz & The Tantrums, Noah & The Whale, Tinie Tempah, The Vaccines, Foster The People, The Naked and Famous, Friendly Fires, Young The Giant, The Joy Formidable, Afrojack, Collie Buddz, Pretty Lights and a whole lot more. August 5-7 in one of the greatest cities in the world should be quite the music scene. At $215.00 for three days of an insane amount of music, seems like a heck of a deal to me.